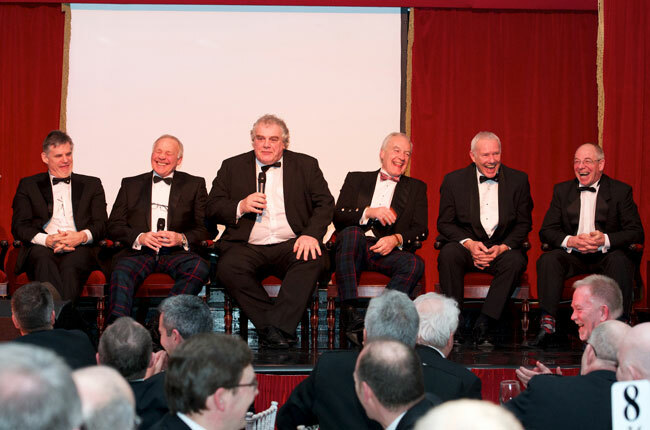 The 32nd Annual Sportsman’s Charity Dinner celebrated England’s visit to Murrayfield for the 6 Nations Championship. Different from the generic 'sportsman's dinners' it has a strong tradition and attracts a loyal following, with many supporters attending year-on-year. The 2014 Dinner was hosted by TV sporting personality Dougie Donnelly, and diners will have the opportunity to hear from members Scotland’s 1984 Grand Slam Team - Jim Calder, Roy Laidlaw, Iain Milne, Iain Paxton and John Rutherford and Alan Tait, Dalmahoy’s Director of Golf. Download our pdf for profiles of our speakers. From the world of stage, television and radio, Tom Allen continued The Sportsman’s Charity’s policy of introducing new names to Edinburgh audiences. Tom’s comedy credentials are impeccable with great reviews from, amongst others, The Scotsman “Otherworldly...a delight of raconteurship” and The Guardian “Tom Allen, a great storyteller whose ability to provide riotous entertainment deserves to net him a wider audience…his live work sees him telling outlandish tales from his seemingly very eventful life. Allen is one of life's true eccentrics, a being who exists at an angle to the rest of us”. Seasoned auctioneer Willie Hunter encouraged bids for unique and exceptional auction lots. A proud Catalan, Denis Ribas was born in Perpignan in 1954. During his childhood his father, a famous mountaineer and writer, instilled in him his passion for nature. Denis originally trained at the Perpignan School of Fine Arts and is now recognized as one of France’s greatest living artists. Denis only paints en plein air (outdoors) all paintings being completed in one sitting and never subsequently amended. As well as being an internationally renowned artist, Denis’s early career included representing France as a middle distance runner against the likes of Seb Coe and Steve Ovett. Denis much admired the late John Bellany and has donated his recent work, an homage to the East Lothian painter, for auction in aid of the Teenage Cancer Trust. Denis attended the Dinner and assisted in auctioning the painting. The two main beneficiaries of funds raised at the Dinner were Combat Stress, the veterans’ mental health charity, and the Scottish Golf Trust charged with expanding and enhancing golf in Scotland. Smaller charities operating in the fields of children and young people, disability, sport and the disadvantaged also received funding.